This book proved to be a simple read and I was forewarned by a couple of people that they hadn't really liked it. So, I went into reading this book without expectation at all. I also tried to give up any preconceived notions I had on heaven. Perhaps, this is best way to read it because, surprisingly, I enjoyed it better than I thought I would. Eddie is the main character and it begins with his death. Of course, the story is predictable but I think it is meant to be. It might seem strange to start a story with an ending. But all endings are also beginnings. We just don't know it at the time. Eddie has five encounters with people in heaven. Albom writes in flashback format, so you learn different things about Eddie while he was alive with these people on his birthday's. I wish there was a different way this could have happened without the chapter heading "Today is Eddie's Birthday" because it did get a little old. I can't think of how this could be different in order to make sense though. It was fun to discover each of these five people and how they fit into Eddie's life. I think Eddie expected them to teach him, which they did, but they also needed to see and tell him something in order for them to progress in heaven. I thought this was interesting because Eddie is always thinking about how they relate to him when all they needed was for him to listen to them. So, it goes from a feeling of knowing what is real in Eddie's perception to a feeling of what is real in the other character's perceptions. Kind of like selfish to unselfish. That was the best thing for me I think to get out of it. 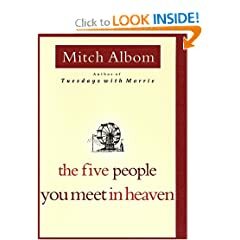 I wouldn't tell everyone to read this because I think I liked Tuesdays with Morrie better by the same author overall, so I would mention that first to someone. In the end, I enjoyed it just as Marguerite, Eddie's wife, did: For the bitter and the sweet. I really enjoyed this book as well and I do have a couple of his other books to read when I get to them. It was a nice quick read but the message was lovely. Since he is a quick read, I may read some more from him as well. I thought the message was nice too. Thanks for your comment, Alaine!